The town of Amfiklia is part of the region of Fthiotida, and belongs to the municipality of Lokkda. 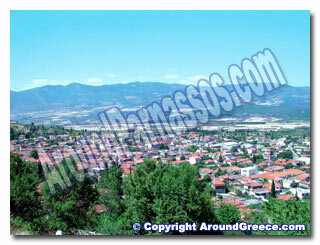 Amfiklia is located at the foot of Mount Parnassos, and more specifically is at the place known as "Plai". The town is built on the northeast slopes of the mountain and is 160km from Athens, 50km from Livadia, 50km from Lamia and 17km from the ski centre of Parnassos. The history of the town starts from the pre-historical days and continues up to the present day. According to historians, the location of the ancient town was previously where the cemetery is today. This is located up on the hill where you can still see traces of the acropolis wall, and the acropolis tower, which is now called "Palaiocastro". The original name of the town was Ofitia, which means "the place where the snake lives". The ancient traveller and historian "Pafsanias", who also wrote about the history of the towns name in his book, which tells us about the leader and ruler of the first inhabitants who were Pelasgoi. When the ruler had his child, who was his successor, he hid the baby in a large earthen jar, to keep it safe from a probable conspiracy that was going against him. However, a wolf came down from Mount Parnassos and attempted to attack the child. However, a snake (which is the symbol of Dionyssos) was lying around the jar when the wolf tried to attack, and the wolf withdrew. The childs father however, saw the snake around the jar and thought that the snake was attacking his child. He threw his spear at the snake, but tragically, as well as the snake, his child in the jar was also speared and was killed. This lead to the town being named Ofitia, and lead to the god of Dionysos becoming very sacred, and the festivities taking place under his name. Even today, we can see similarities with the Dionysos festivals and the Greek Halloween. People still carry burning torches, which is a tradition that has continued from the ancient years of Dionysos. The next inhabitants were the Fokeis and the Dorieis who pushed away the Pelasgoi. The writer Herodotus makes comments in his book "Midics" regarding this place. Pafsanias also informs us of the third name for the town, which was Amfiklia. This was during the period of 346 BC, after the rule of the Amfictions, for the memory and glory for the town, which was destroyed during the Focic war. The word Amfiklia, is probably the female version of the name Aficlos and Amfiklis. The first part of the word "Amfi" means the environment, and the second part "cleos" means Glory, Fame and Honourable. Therefore, Amfiklia means a respectable and glorious city. During the Byzantine period, Amfiklia was again renamed to Dadi or Dadion, which means, "Torch". There is also a connection to the word "Das", which comes from the verb "Daio", meaning to "put on fire or burn". The name of "Dadi" was used until 1915, when the Internal Ministry published a law, and the town reverted to its original name of Amfiklia. The Castle of Palaoipirgos has been situated on a hill to the west side of Amfiklia since the French occupation. The tower is square and consists of two floors, and is 11m in height. The height of the acropolis from the sea is 530m, and this gives it the perfect position for a unique view of the Kifissos river, the valley and the surrounding villages. Legend states that the tower is connected underground with a well, which is out of the great wall which was protecting the city, and that this well always has water. 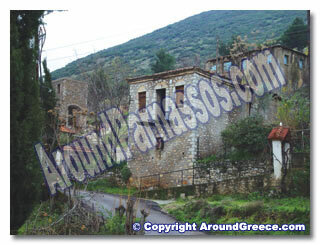 The monastery is 8km from the village on the way to the ski centre of Parnassos. This monastery gives the impression of a fort inside the thick vegetation. The monastery is for women of Panagias Gavriotisas. The church celebrates the birthday of the Virgin Mary Panagias Theotokos on the 8th September. There is also a festival on the 6th August, because the precious icon of Virgin Mary was found on that day.